Thirty Australian Poets is a new anthology out of UQP that focuses on the work of poets born after 1968. It’s an intriguing conceit that invites comparison with the work of the Generation of ’68 without actually issuing a challenge per se, but at least prompting a ‘look where we are now’ conversation. Since this constraint naturally excludes both poets who make up Australia’s vibrant live poetry scene (who tend not to be as widely published on the page) and also talented poets whose work may not have yet been collected, the poetry on offer does tend toward the formal. Since this constraint naturally excludes both poets who make up Australia’s vibrant live poetry scene (who tend not to be as widely published on the page) and also talented poets whose work may not have yet been collected, the poetry on offer does tend toward the formal. That said, if you’re happy with a slight caveat, Thirty Australian Poets (Who Mostly Write for the Page and Who Have Been Around Long Enough to Develop Both A Body of Work and The Networks to Get Said Body of Work Published) is a good and broad selection of contemporary Australian poets from within its openly established parameters. The aforementioned variety resulting from editor Felicity Plunkett’s choices provides something for (almost) everyone on its nearly-300 pages. Because of this, Thirty Australian Poets is an anthology that pleases, intrigues, introduces, challenges and confirms in equal measure. A poetry anthology that purports to present the current state of play should do three things: 1) it should expand your poetic world by introducing you to your new favourite poets, 2) it should reassure you and confirm your good taste by including poets whose work you know and love, and 3) it should challenge you by including poetry that falls outside your personal tastes so that you are not limited to living in your own comfortable and self-affirming bubble. Based on this principle, I have culled from the pages of Thirty Australian Poets the beginnings of a largely hypothetical collection (not at all available where all good books are sold) entitled ‘Selections from the Best of Thirty Australian Poets According to Adam Ford’, and it’s divided into three sections: ‘Expansion’, ‘Reassurance’ and ‘Challenges’. ‘Expansion’ features the work of poets I hadn’t encountered before picking up Thirty Australian Poets. This is where Plunkett’s decision to anthologise only poets with published collections bears fruit, making it a simple task to turn a list of new favourites into a shopping list. no force but his own was needed to maintain the velocity. Though wind helped occasionally with acceleration. Michelle Cahill’s ‘The Stinking Mantra’ is a detail-rich meditation on the domesticity of death as a mother finds time in her busy day to sit under a tree with the decomposing body of a possum, its pelt ‘tattooed by a powerline’. Justin Clemens’s ‘Whirl’ is fun and a sonnet. His poems in Thirty Australian Poets might seem at first to be simple exercises in vernacular, but reading closer reveals them to be structurally formal and precise. ‘Whirl’ is a particularly good example of this: a love sonnet that pushes its initial metaphor to delightful excess without ever losing focus. Nick Riemer’s ‘The Thing You’re In’ is a paean to time passing too fast and without pause, and to the intangibility of past experience. ‘I type a full-stop and an arrow appears,’ Riemer says, haunting the reader with a quietly terrifying image of lost control. Maria Takolander’s ‘Tableaux’ and ‘Unborn’ are both considerations of parenting that offer different aspects of the relationship between mother and child. What makes them stand out as parenting poems is their lack of sentimentality and their calm determination to assert the mother’s independence and individuality without turning away from or diminishing the child or their relationship. They also flirt with pop culture references – Daffy Duck and Wile. E. Coyote in ‘Tableaux’ and Dr. Who in ‘Unborn’, while still retaining a gravitas and allowing room for more classical references like ghosts, souls and medieval Christianity. My ‘Reassurance’ category features the work of poets I’ve had my eye on for a while, writers I personally think are deserving of the kudos of inclusion and who should be read much more widely. Coming across these guys in amongst their anthologised fellows is akin to hearing that song you really like come on the radio as part of a drivetime afternoon. David Prater’s ‘Lurker’ is a poem I’ve admired and shared for years, a great example of a poet writing about the online world in a serious way without simply seeing it as a font of new-yet-obvious metaphors. It’s always refreshing when Prater writes about the internet, because he uses metaphor to describe the experience of being online, instead of the more common approach of using the online experience as a metaphor itself for something else. Ali Alizadeh’s ‘Listening to Michael Jackson in Tehran’ is a great evocation of both the adolescent desire to be admired by peers and the mundane ubiquity of American popular culture even in the most unlikely of places. My life is told in their naked surface. The final section of ‘Selections from the Best of Thirty Australian Poets According to Adam Ford’ is ‘Challenges’, and it features work that may not be to my own taste, but which nevertheless belongs on the anthology’s pages to allow it a readership beyond those who simply share my tastes and opinions. Not to dwell on negativity, but a few of the names in this final section include Judith Bishop (too obscure for me), Esther Ottaway and Claire Potter (too many epigrams for my liking, too much playing with layout), and Michael Brennan (too sentimental and inward-looking). Other readers may enjoy these poets’ works, which may fail to please this reviewer, but which are undoubtedly finely crafted examples of their kind. With its breadth of scope and its well-articulated selection parameters, Thirty Australian Poets undeniably succeeds as an anthology. The specifics may vary from reader to reader, but there is enough material here to entertain, excite, reassure and challenge anyone even slightly familiar with the – based on the poems included, strong and healthy – state of play of contemporary Australian poetry. 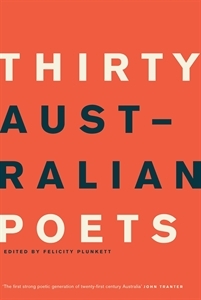 For those completely unfamiliar with such things, Thirty Australian Poets is a great introduction to what (certain aspects of) Australian poetry has to offer. All in all, Thirty Australian Poets is a cracker of a read, with lots to like and enough variety to appeal to a range of tastes. It’s a bedside-table warmer to come back to again and again. Hopefully it marks the beginning of a new series of regular anthologies so that poetry readers can look forward to the future publication of Thirty More Australian Poets. This entry was posted in BOOK REVIEWS and tagged Adam Ford, anthologies, Felicity Plunkett. Bookmark the permalink.